Quick answer: Look for peak bluebonnet season in early April. Caveat: It’s difficult to predict exactly when bluebonnets will peak from year to year. We encourage you to explore your environment and see how things are looking. Variations in climate and other conditions determine whether we have a stunning bluebonnet year or a year that is merely stunning. Bluebonnets rosettes (clusters of leaves) grow over the winter. In late winter and early spring, after the warm rains begin to fall, the rosettes grow into larger plants and begin to blossom. The amount and timing of fall and winter rain determines the success of germination and the blooming season. Cool spring weather will slow down the show while warm weather speeds it up. That said, bluebonnets typically start blooming in the “bluebonnet belt” of Central/East Texas toward the end of March and continue through mid- to late April. This is one of the most common questions that we get. If it’s early April, chances are very high that bluebonnets are blooming. You may also be able to find some blooming in March and May. Any other time of the year, there are no bluebonnets blooming aside from a renegade here or there. However, there are plenty of other beautiful wildflowers that bloom throughout spring and summer, many of them creating equally stunning displays of wildflowers across the state. Explore our Texas Top 20 to meet some of those beauties. Want to stay updated on bluebonnet happenings? Check our Facebook and Instagram for real-time updates and keep an eye on our Texas Wildflower Central page. Why do we see big fields of bluebonnets and bluebonnets on our roadsides? Bluebonnets are annual wildflowers that thrive in degraded soils in full sun with little competition. That means that you’ll often see big fields of bluebonnets on heavily grazed land, land that has experienced recent fires, and land that has been mown, such as a roadside. In fact, TxDOT times roadside mowing to allow for bluebonnets and other wildflowers to reseed for following years. How do I grow bluebonnets? Bluebonnets are best grown from seed planted in the fall. 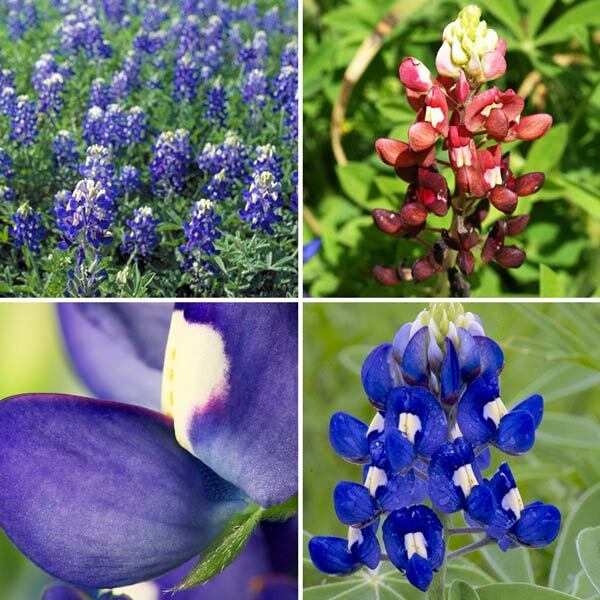 Click here to read our full how-to article on growing bluebonnets. No, it isn’t. However, we encourage you to leave bluebonnets for everyone to enjoy. Learn more here. Bluebonnets don’t mind the cold. They typically germinate in late October and form a small rosette (or circular cluster of leaves) that persists through the winter — freezing weather and all. They are adapted to survive Texas cold snaps. When there is a frost or freeze, you will often find the rosettes covered in beautiful ice crystals. What are bluebonnets good for? First, they are pretty to behold, and they have an intoxicating scent! They also fix nitrogen, which enriches the soil for other plants. Their flowers are attractive to pollinators, and they support several butterflies as host plants including northern cloudywing, gray hairstreak, Henry’s elfin, painted and American lady, and orange sulphur butterflies. Why do I see white, pink or maroon bluebonnets? Though bluebonnets are typically blue, occasionally you’ll come across light blue, white or pink flowers growing in the wild. These are natural variants caused by genetic mutations. These variants generally don’t stick around in wild populations because blue flower color is dominant. When pollen from the blue flowers pollinates flowers of the other colors, the resulting seeds from that cross will more likely develop into blue-flowering plants. Eventually blue will swamp out the other flowers in the population. This variability is what horticulturists take advantage of to create new plant varieties. In fact, Jerry Parsons, horticulturist at Texas Cooperative Extension, created several varieties of bluebonnets during his career, including a maroon bluebonnet in honor of Texas A&M University where he worked. Explore 300 questions about bluebonnets answered by our experts.